Emotional make up of the patient: Patient’s reactive and behavior pattern, some prominent emotions, the impact of emotional circumstances, etc. Physical factors such as thermal sensitivity, natural preference for food, etc. Some of the commonly used remedies have been described in brief here. It must be noted that the description offered herewith is neither complete nor exclusive; as there is flexibility on the part of a qualified homeopath to make prescription based on one’s clinical judgment. The following photos simply demonstrate how homeopathic medicines stimulate re-pigmentation. Please click photos to enlarge. Kali Carbonicum: Potassium carbonate undergoes the process of potentization to evolve into a powerful deep acting homeopathic remedy called Kali Carb. Kali carb is a polychrest drug i.e. having effects on multiple organs and systems in the body. It has a broad sphere of action and is useful for a wide range of diseases. Kali Carbonicum positively influences lungs, digestive system, heart, liver, kidney, female reproductive system, skin, etc. Kali Carbonicum does wonders in cases of asthma, bronchitis, tuberculosis, pneumonia, hydrothorax, etc. It is one of the commonly used remedies for vitiligo, warts, eczema, urticaria, hair loss, trigeminal neuralgia, sciatica and low backache, hypothyroidism, heavy menstrual bleeding, etc. It is also useful for complaints of digestive system like acidity, piles, jaundice, gastritis, etc. On the mental sphere, it tackles anxiety states very efficiently and is used for the treatment of the effects of stress on the body. Silicea (Silica): It is one of the splendid acts of homeopathy that substances labeled as inert can also be used effectively to treat a large variety of disorders. Silica is the example of one such substance, which is chemically inert in its natural form, but after undergoing the process of potentization it gets transformed into a wonderful, deep acting remedy. Silica is in a true sense called as polychrest remedy as it has a broad spectrum of action, useful for a wide range of disease processes. In fact, this remedy has helped Homeopaths world over to treat so-called surgical conditions gently without requiring a knife. This drug is prepared from the metal Silica (Si), sand. 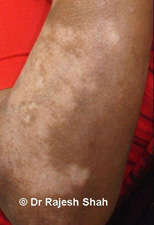 It is a popular remedy for those vitiligo patients who are sensitive to cold wind (breeze, air-conditioners, winter); who tend to sweat on palms and soles; have typically offensive foot-sweat; have lean-thin physical body structure, and may additionally have a tendency to have easy pus formation after injury. Arsenicum Sulfuratum Flavum: This is one of the specific remedies used for the treatment of vitiligo in homeopathy. It has discoloration of the skin in blotches that are pale or white in color. It is also a good remedy for eczematous lesions which are moist and have intense itching with corrosive discharge. Pyoderma and urticaria also find a solution to this drug. Its sphere of action also extends to catarrhal affections and asthmatic states. 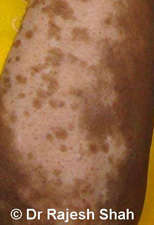 A deep acting drug which has been known to give good results in Leucoderma (vitiligo). Syphillinum: Syphilinum belongs to a group of homeopathic drugs called as Nosodes which are prepared from disease products or diseased tissues. The remedy prescribed does not contain the original drug substance in the material form but it contains only the dynamic curative powers of that substance. This is achieved through the process of potentization in homeopathy. Syphillinum is a deep acting, polychrest remedy affecting multiple systems of the body. It positively influences the mind, sensorium, skin, gastrointestinal tract, genito-urinary system, nerves, bones, etc. It is a very helpful remedy to combat hereditary syphilitic tendencies in patients. Syphillinum is frequently used in the homeopathic treatment of vitiligo, recurrent abscesses, osteomyelitis, trigeminal neuralgia, alcohol dependence, rheumatic complaints, etc. It's a useful drug to combat diseases that are destructive in nature and are deep-seated. Nitricum acidum: As the name suggests, this drug is prepared from nitric acid. It must be remembered that the remedy does not contain the original drug substance in its material form but it contains only the dynamic powers of the drug which are released after it undergoes the process of potentization. Its one of the commonly used drugs for vitiligo, warts, ulcers, fissures, gastritis, hemorrhoids, bony and rheumatic affections, malignancy, cachexia, etc. Carcinosin: It's the beauty of the homeopathic system of medicine to be able to use not only plants, animal products, and minerals but also certain disease products and diseased tissue for curing various ailments of patients. These are called as Nosodes. Here is a remedy prepared from the material derived from the carcinoma of the breast. It must be borne in mind that the actual medicine does not contain any part of the original substance in the material form. Only the dynamic powers of the original drug substance are present in the final medicine. Carcinosin is a deep acting constitutional drug having many indications and a very broad spectrum of action. It is useful for a wide range of disease processes, all of them cannot be described here, but a few of them are discussed here. It positively influences mind, lungs, heart, eyes, skin, bones and joints, nerves, etc. It is one of the commonly used remedies for diseases like vitiligo (Leucoderma), urticaria, lichen planus, styes and chalazion, hair loss, asthma, insomnia, trigeminal neuralgia, etc. Homeopathy believes that the genetic predisposition or inherent susceptibility is usually the root cause of a wide range of diseases and Carcinosin in one such remedy which is used to combat these genetic tendencies effectively. Hydrocotyle Asiatica: This is a remedy that is prepared from the plant called Indian Pennywort. The tincture from the whole fresh plant is used for the preparation of this remedy. After undergoing the process of Potentization, the curative powers of this remedy are brought forth. This is one of the very good remedies for vitiligo. It is supposed to stimulate the process of pigmentation. It is also beneficial for other skin problems such as psoriasis, lupus, leprosy, acne and other disorders of the skin in which there is much exfoliation of the skin. This medicine is often prescribed in combination with a constitutional medicine or other deeper acting medicine to get the best effect. Natrum Muriaticum: Natrum Muriaticum is an interesting example of homeopathic medicine prepared from a common food substance, the common salt, sodium chloride. As a rule, the common salt undergoes a special procedure called potentization, whereby its inner healing power is activated to make it available for healing. Constitutionally, this medicine has a broad spectrum of action and is useful for a wide range of disease processes affecting the skin, gastrointestinal organs, nose, lungs, kidney, metabolism, muscles, head, hormonal system, etc. It is one of the commonly used remedies for hair loss, fissures-in-ano, urticaria, migraine, eczema, lichen planus, vitiligo, asthma, etc. Natrum muriaticum is frequently prescribed in cases of vitiligo and is one of the very good remedies for the same. Phosphorus: This is a wonderful remedy prepared by the potentization of inorganic phosphorus. After undergoing the process of potentization, the latent healing powers of this drug are brought to the surface and it proves to be a wonderful remedy capable of curing a wide range of diseases. Phosphorus predominantly acts on the skin, gastrointestinal tract, hepatobiliary system, blood, kidneys, bones, lungs, nervous tissue, etc. It is frequently used in the homeopathic treatment of vitiligo (Leucoderma), hair loss, nephrotic syndrome, hepatitis, cirrhosis, hemorrhagic tendencies, respiratory infections, osteomyelitis, paralytic symptoms, etc. Few of its common skin symptoms are Loss of pigmentation in spots, white discoloration of the skin. It is also used for skin disorders where the patient has much itching and burning of the skin; in urticaria, psoriasis. It is also a good drug for hemorrhagic spots occurring on the skin at various places. Note: • There are over 30 commonly indicated medicines for Vitiligo. Exact medicines are selected on the basis of on individual case history and symptoms. • Please avoid self-medication with any of the above medicines, as it may not work!